During this review of James Cameron’s long-awaited film, Avatar, respected film critic Mark Kermode dismisses the much talked about 3D version as ‘flim flam’. After taking his glasses off to view the un-rectified, blurred 2D image, it looked just as impressive, he says. I’m a big fan of Kermode and love his reviews. In general, he seems to get it spot on (even if he is a bit of a humourless old bore when it comes to comedy films) but I wholeheartedly disagree with this element of his Avatar review. Aside from spears flying at you and people falling into ravines, Kermode goes on, you simply don’t notice the 3D anywhere else. I’ve heard several people mention something along these lines after seeing the film and I honestly wonder if they’ve walked into the 2D version by mistake. The 3D is present in every frame and adds depth to the various lush environments Cameron has created. Those who play first person computer games will know how important it is for the world you are thrust into to feel real and there is only so much depth that can be offered in a 2D image. 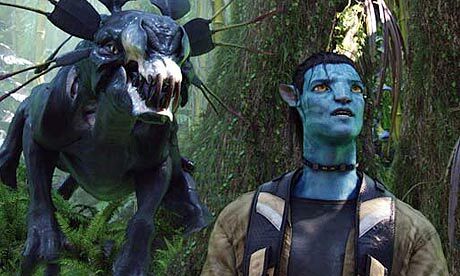 In Avatar, trees, people and items which are in the foreground are in the foreground and items in the distance are in the distance. It takes a while for your eyes to adjust at first, but once they do, it is magic. It’s hard to explain without seeing it, therefore I urge you to head to your local multiplex if you haven’t already done so. It’s the first 3D film I’ve seen and it looks like I’ve picked the best one. Hugely impressive, even if the film was a little flimsy on the whole. As the 3D debate rages on, I simply can’t agree with the notion – as suggested by Kermode and various other critics – that it is simply a mechanism to stop piracy. This is clearly nonsense, as all 3D films so far have been released in parallel with a 2D counterpart. Therefore, there will always be a version for someone to steal and put on the internet. Here’s to more genuinely immersive 3D films and, something which excites me even more, 3D computer games. It’s like the 80s all over again, only better.